The Latin root for the English word for Discern is discernere; to distinguish between, to determine, resolve or decide. It is vital for every Catholic to be able to properly discern the will of God in their lives in order to live a genuinely happy and fulfilling life. God never ceases talking to us; we just need to learn how to develop, as our Master taught us, an “ear to hear” (Mk. 4:9), and the greatest place to hear Him is while before Him in the Blessed Sacrament. TRULY AND HONESTLY DESIRE THE WILL OF GOD – You must authentically want to do what God wants you to do. Our will natural-ly wants to do what it wants to do, whether God wants it or not. Therefore, you must be willing, from the very beginning, to commit to do His will, without reserve, knowing that He may take you out of your comfort zone and it will involve sacrifice on your part. Then pray and vow to Him that you truly desire to do His will. PRAY FOR THE GIFT OF WISDOM – Wisdom makes the soul responsive to God in the contemplation of divine things. It paves the way which gives the other elements of discernment a foundation to build upon; it is a gift of the Holy Spirit. Ask for it, as St. James tells us, and it will be given to you. Also, petition your guardian angel to assist you in hearing and knowing the voice of the Holy Spirit and to ward off any evil spirits. KNOW CHURCH TEACHING – The Church is the voice of Christ. If we want to discern the will of God in our lives, we must first know what He has told us through His Body, the Church. Do not be intimidated and pick up the Bible and the Catechism of the Catholic Church, Magisterial documents and the writing of the saints and doctors of the Church. Develop a well-formed conscience. Discuss your findings with your confessor, a learned priest, religious or lay person as well. GO TO HOLY MASS AND CONFESSION OFTEN – It’s of the utmost importance that you remain in a state of grace throughout the en-tire discernment process. Sin clouds the mind and you will be more susceptible to error and the instigation of the evil spirit and decep-tion. These two Sacraments will give us the grace, the power, to remain in friendship with God. 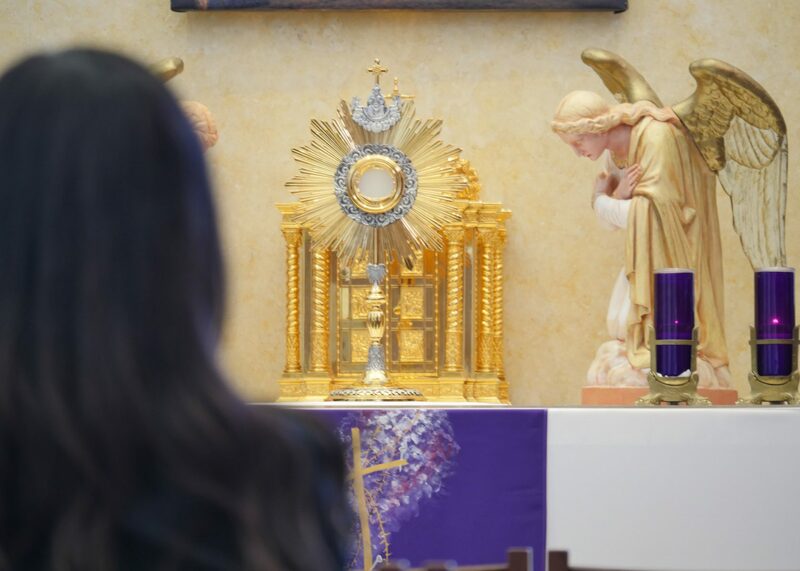 GO BEFORE JESUS IN THE BLESSED SACRAMENT – Take the issue you’re trying to discern and spend time before Jesus. Do not ex-pect results immediately and don’t expect any overwhelming sense of emotion or love to flood you. That is not how God normally oper-ates. Just sit with Him and think about your options. Weigh the pros and cons of each one carefully, with sound reason, and see which one you feel drawn to. BE PATIENT – Repeat the above process as many times as you need (which in some cases can take months but not always) and see if you keep getting drawn to a particular option over and over again even if you’re nervous about it because you know it will take you out of your comfort zone and could involve sacrifice and, perhaps, even suffering. MAKE YOUR CHOICE BEFORE GOD – Once you have noticed this “tug” time and again, and have readied yourself to trust God and you feel a mysterious peace and calm, kneel before Jesus in the Blessed Sacrament and tell him what you’re going to do and ask Him to bless it. Then begin your journey in complete trust and watch God move like never before! The more often you use this method the easier it will become, and the more acute your spirit will be in sensing the Holy Spirit’s (and your guardian angel’s) inspirations in everyday life. It is life lived the way God intended it to be. God’s will is our happiness and He’s always right there guiding our footsteps and paving the trial. We just need to take up our cross daily and learn to follow Him!